Spreading the Word about GIS — Cloudpoint Geographics Inc.
One thing we love about working at Cloudpoint Geographics is the ability to spread the good word of GIS and how powerful of a tool it can be for an organization. Over the past few weeks several Cloudpoint staff members have had a variety of speaking engagements ranging in topics from mobile mapping implementation, to overhauling utility mapping, to a general overview of what GIS is, and why updating maps is important. This was true for both Jonathan and Joe as they hit the road to talk GIS and all things geospatial. 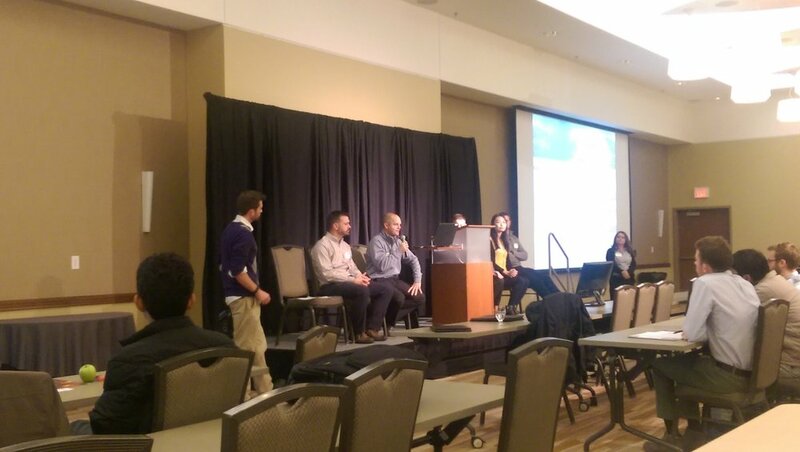 Cloudpoint President, Jonathan Hodel, answering questions during the Career Connection panel discussion at the University of Illinois GIS Day event. Jonathan was happy to present at the Traffic and Highway Engineers conference in Champaign-Urbana. It was a huge turnout and he was able to captivate the audience and get into specific applications of GIS for use in traffic safety. Since then, Jonathan was also asked to participate in the Career Connection panel discussion at the recent University of Illinois' GIS Day. He was asked a variety of questions about how to get started in the geospatial world, and what traits the company looks for in potential candidates. Joe Christian presents a Lightning Talk about UAV Mapping at the University of Illinois GIS Day. Joe also spoke at the University of Illinois' GIS Day event, but he gave a Lightning Talk about UAV Mapping. A lightning talk is a short 5 minute PowerPoint presentation that consists of 20 slides that are set to auto advance every 15 seconds. It went smoothly and very quickly. Joe also had the pleasure of speaking to a group of about 30 people at the Illinois Rural Water Association Administrative Conference about GIS and why overhauling outdated maps is important. Although a majority of the attendees had little or no experience with GIS, Joe was able to capture their attention and impart the importance of utility mapping to the crowd. Being able to get people excited about GIS and to start to understand how powerful it can be for any organization, is a great feeling! We love being the organization that people turn to when they need assistance with geospatial projects, and nothing helps us showcase our knowledge of the subject matter like public speaking! Older PostAnother Successful ILGISA conference!